Accurately cover the breadth of content in the new 2017 AQA A-level specification with this textbook written by leading Law authors, Jacqueline Martin and Nicholas Price. 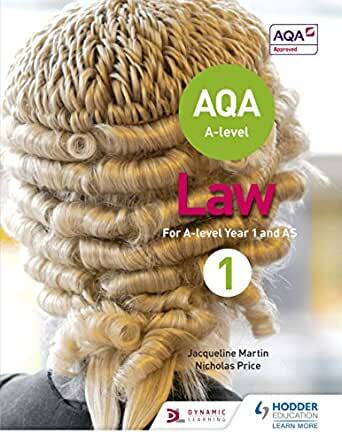 This engaging and accessible textbook provides coverage of the new AQA A-level Law specification and features authoritative and up-to-date material on the important changes to the law. - Book 1 covers all mandatory units for AS-level and for year 1 of a two-year course. - Important, up-to-date and interesting cases and scenarios highlight key points. - Discussion and activity tasks increase your understanding of more difficult concepts. - Practice questions and 'check your understanding' questions to help your students prepare for their exams. - Jacqueline Martin LLM has ten years' experience as a practising barrister and has taught law at all levels. - Nicholas Price is an experienced teacher of Law and an A-Level Law textbook author.